Ban wishes to thank all delegates for their active participation to further the cause of environmental justice and environmentally sound management of materials and waste, at the recent meeting of the Open Ended Working Group. Many of you unfortunately were unable to attend the NGO side events. For this reason we are providing you below with the slides and films. In the case of the feature-length documentary film "Toxic Playground" we are providing you with a link to this amazing film that poignantly captures a real-world example of how waste trade works, its victims, its causes and the long-term devastation it can cause. We highly recommend taking the 70 minutes to turn off the lights and experience this film with your team at home. We have also included the powerpoint regarding the short history of the Ban Amendment we used as part of this side event. 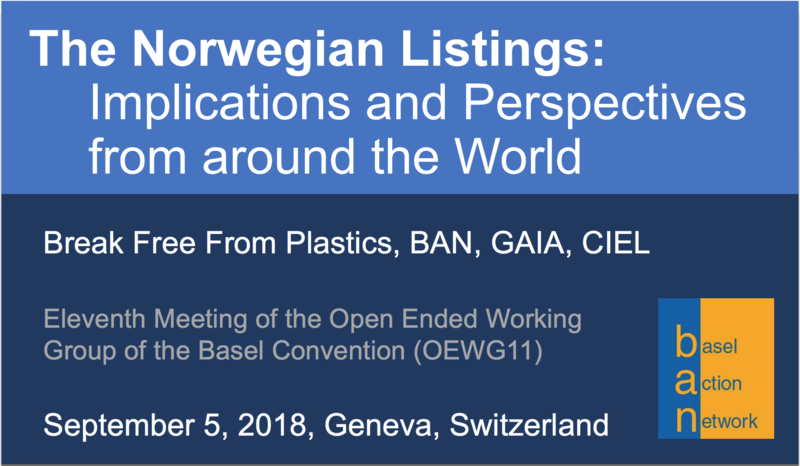 Finally, the powerpoint program of the side event on the Norwegian Plastics proposal we have included as well. This event was well attended and many have asked for this powerpoint. 1. India and Brazil speaking truth as to the harm the e-Waste Technical Guidelines will cause. 2. France announcing that they will be contributing 500,000 Euros to improving the governance of the Bamako Convention and its synergies with other instruments. 3. Namibia announcing their very recent ratification of the Basel Ban Amendment, bringing the final count to but 2 ratifications short of entry into force. 4. Major support demonstrated for the Norwegian Proposal to list solid plastic waste on Annex II of the Convention. 21 of the 26 interventions spoke to direct support to the Norwegian proposal as a matter of urgency. 1. The EU and Australia insisting that the final report of the meeting NOT characterize the 21 countries that spoke up in direct support of the Norwegian Proposal as indicating "broad support" for the proposal. The EU intervened to claim that their members represented 27 countries and thus 21 v. 27 does not indicate widespread support. This was clearly seen by observers as the EU explicitly going on record as NOT supporting the proposal. 2. Technical Issues Contact Group Chair's refusal to allow any changes to be discussed on the e-Waste Technical Guidelines at the meeting, disallowing points raised by Iran and India and BAN. 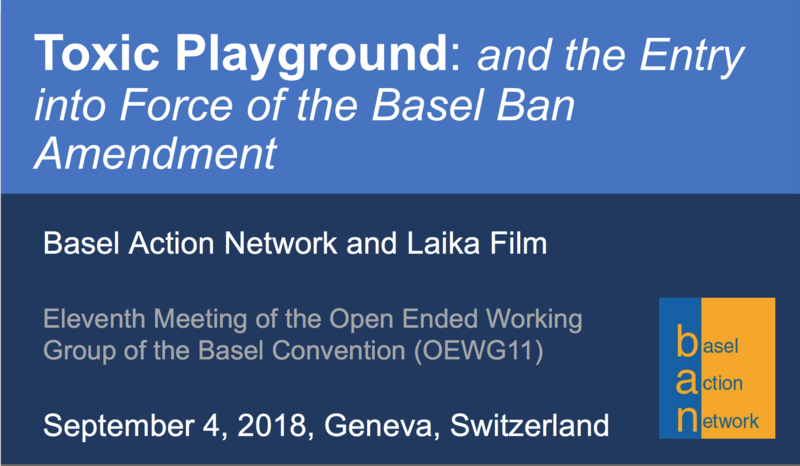 The Technical Guidelines still fails to address the major concerns that it proposes altering the definitions of the Basel Convention via Guideline -- something that should never be allowed. Click here to view all documents and interventions for OEWG11.